Boiler Room - What Does It Mean? 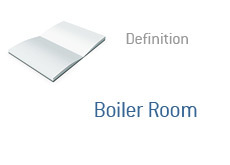 What is a "boiler room"? What is the definition of a "boiler room"? A boiler room is a slang term used to describe an operation that is engaging in the sale of fraudulent (or extremely shady) securities issues. Boiler rooms use high-pressure tactics and outright lies to try and sell worthless stocks to the general public. A "boiler room" is generally just a single room that is crammed with people who are all attempting to do the same thing - push worthless stocks to the public. A "boiler room" doesn't necessarily have to sell stocks - they could sell anything of little value. "Boiler room" operators train their workers to refuse to take "no" for an answer, feeding them with comebacks to every possible answer imaginable. "Boiler room" workers are typically paid in commissions, depending on how much "product" they move over the course of an evening. Boiler rooms usually engage in deceptive and fraudulent practices, which is why they are inelegant and highly mobile. A "boiler room" operation could easily shut down and open up in a new location over the course of just one evening, because they are basically just rooms filled with banks of telephones and desks. For a glimpse into what a boiler room can look like (on a highly sophisticated level), watch the movie "Boiler Room".